Perseus, home to such wonders as the California Nebula, also harbors just this one Messier object, open cluster M34. Perseus also hosts the more famous Double Cluster, so M34 tends to be overlooked for those more famous clusters. M34 is home to about 100 stars, all about 250 million years old (newborns compared with the Sun's 4+ billion years!). All these 100 stars are crowded together into a region of space just 10 light-years across. This image is a relatively short "first proper light" for my Vixen VC200L. 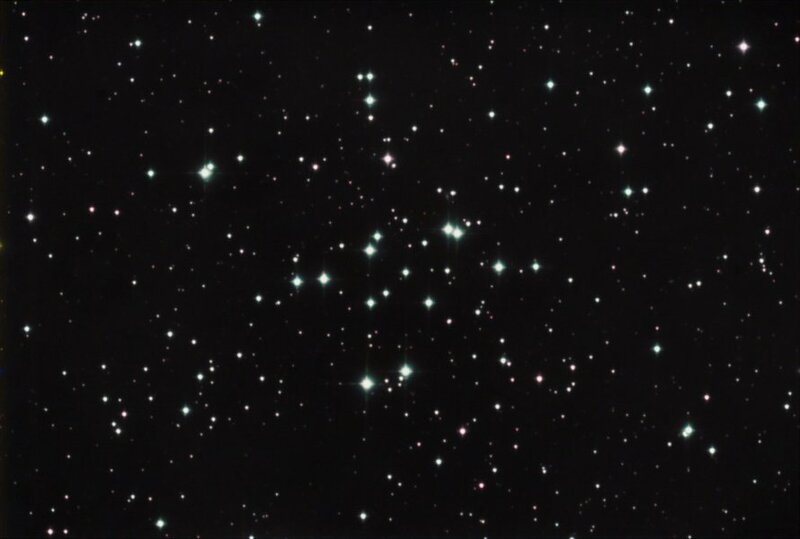 Notice that my open cluster images tend to be "first light" images? This is again a testament to the fact that they are bright enough to get good results from short exposures! Equipment Used: Vixen VC200L on an Astro-Physics AP1200GTO mount. SBIG ST-10XME camera with 5-position filter wheel and Astrodon LRGB filters. Self-guided. All images and content copyright 1997-2019 by Eric Africa unless specified. Please do not reproduce or distribute without permission.